Woodlands Retirement Community provides respite services for members of the community at large who require assistance with acts of daily living when their family or private in-home caregiver needs a rest or vacation from his or her responsibilities. Caregivers can reserve our services for a week or more, knowing that their loved ones will receiving excellent care here at Woodlands in a safe, attentive and supportive environment while they are away. To learn more about respite care services, please call (304) 697-1620 and ask for Jane Bester. You may also request information by using the Contact Form found at the right of this page. Woodlands Healthcare Division just completed its fourth straight annual state survey from West Virginia’s Office of Health Facility Licensure and Certification with zero deficiencies. Learn more. 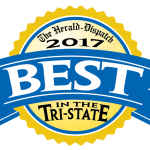 Woodlands Retirement Community was named the Best Assisted Living Facility in the Tri-State by 124,000 total Cabell and Wayne county voters in West Virginia in Sept. 2017.